He played 17 regular-season games, with 13 starts, at middle linebacker. He also had team-leading 82 defensive tackles and added 11 special-teams tackles, five knockdowns, three forced fumbles, two quarterback pressures, two interceptions and one tackle for loss. 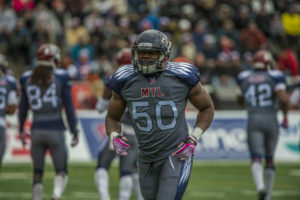 Muamba started both Eastern Semi-Final and Eastern Final, during when he had 15 defensive tackles, two special-teams tackles and one tackle for loss. He has been named 2017 Riders’ Most Outstanding Canadian. 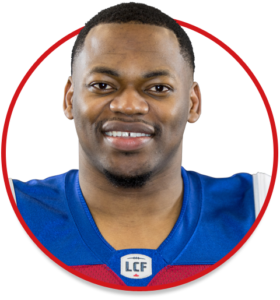 Muamba played in 4 games for the Alouettes, contributing 14 tackles and 1 interception. He recorded 65 tackles and 3 sacks, adding another 20 tackles on special teams. Muamba built upon the strong 2012 season he had with an even better 2013 season. He set a new career high with 106 tackles (2nd most in the league), while also adding 1 quarterback sack, 1 interception, 1 fumble recovery and 1 defensive touchdown. College: Played his Canadian Interuniversity Sport (CIS) football with the St. Francis Xavier University X-Men. Muamba was named the Atlantic University Sport Defensive Player of the Year in both 2008 and 2010. He received the President’s Trophy in 2010 as the top defensive player in CIS. He was a three-time CIS All-Canadian. Born in Kinshasa in the Democratic Republic of Congo, Muamba grew up in Montreal before his family moved to Ontario. His brother, Cauchy Muamba, was a safety for the Edmonton Eskimos.